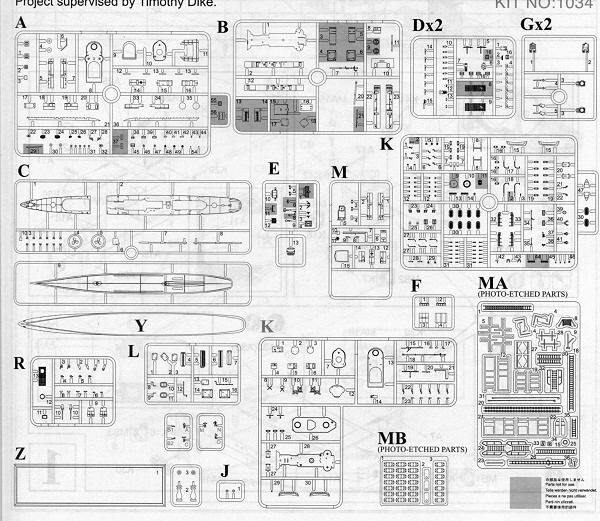 Some of you may be wondering why another 1/350 USS Benson. It may be the same ship, but the kit has quite a different setup. An abundant assortment of brand new parts includes a replacement hull made by slide molds. A completely new hull was called for due to important differences from that of the 1945 build that was initially released. The aft superstructure and deck are also new, as is the main mast with its crow’s nest. Other differences between the two kits are the rangefinder, .50-cal AA guns, and the blast shield for the aft torpedo launcher. A generous selection of photo-etched parts is available for items such as the sky-lookout shield and various ladders. You'll still need to go aftermarket for your railings, though. As usual, the instructions are quite complete and at times, a bit complex. As usual this can be built as either a waterline or a full hull model and a stand is provided for that option. I should also mention that often times, the photo etch parts are optional replacements for the standard plastic bits. This is important to those who are not fond of p.e. Personally, I like the pre-war color scheme for US ships a lot more than the darker wartime colors that were used. I'm hoping that we'll get to see more early and pre-war destroyers from Dragon.